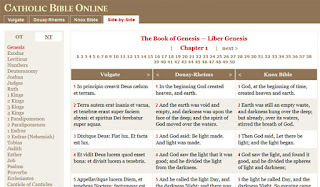 This link will take you to a new site which has the Clementine Vulgate, Douay-Rheims, and Knox in parallel columns with possible search functions. Looks like a great resource, which includes both the Douay and Knox notes. I wonder if Baronius is involved in this? Thanks to Charles for sharing this info with me! Baronius should sponsor an e-book edition, and get it on YouVersion for use with the Bible app, and get it back on Biblegateway. Agree with you completely. Removing it from Biblegateway was a mistake. Putting it on the YouVersion would be very good too. I use it often. Tim, I do not have any disappointment with this site and I am grateful that you posted it. I have bookmarked it as it has become one of my go-to bibles for catechetics. I know you or others will push the NABRE, but since I have spent the last two years soaking up patristic works, especially Origen and Jerome) it is easier to use a bible that is closer to what the father's used. For example, there is nothing worse than trying to read the beginning of Genesis with John Chrysostom and having the NABRE as your bible. Once you hit the wind over the water instead of the Spirit of God over the waters, the NABRE loses me. But in any event, I like this because it reminds of Origen's Hexapla. I would suggest if possible that the old Confraternity text be added as a third option. I have a similar book on the Apocrypha and it is very useful. This is wonderful! Thanks for sharing it! Isn't it? I'm am very happy to see this. They should do an app next. Confraternity would be a nice edition. Good to hear from you! Hope Fr. Peter is doing well. Add your helpful comment to the Confraternity poll I created above. 1. I hope someone comes up with an ebook of the Knox Bible and/or the Confraternity translation. 2. I also hope either of them could be on YouVersion, and make them available offline. 3. A Baronius edition of the Confraternity edition? Well, Sinag-Tala made both the whole bible and the NT available locally. The NT is great, because it is portable and conveniently sized and formatted. But the whole bible is way tooooooo bulky. My spiritual director in the seminary had an old copy of the Confraternity bible which has the right size and thickness. I also saw a Knox bible in the seminary library which is similarly sized. If Baronius will come up with that, size will really really matter. Hey Tim, you don't have to approve this message. I just wanted to let you know the link on your sidebar to this website is missing the colon so it makes a dead link.